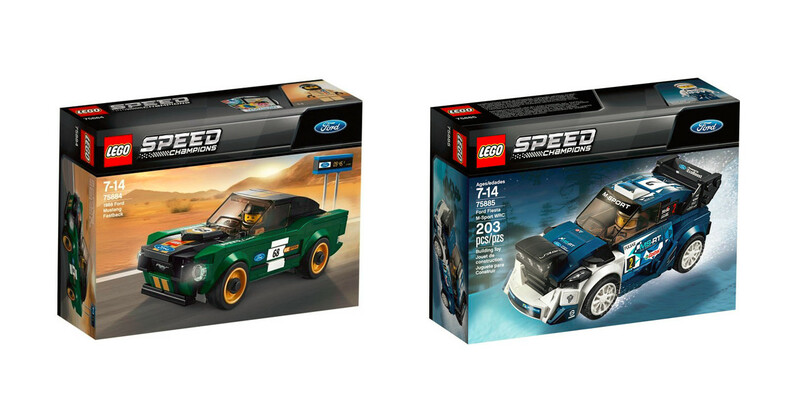 The 1968 Ford Mustang Fastback and M-Sport Ford Fiesta WRC race car are set to join Lego’s range of motoring-themed “Speed Champions” kits, and we can hardly wait to get assembling. They’ll be available from March 1st, and while pricing has not yet been revealed, we’re expecting each to retail for around $15. Each kit comes with the pieces to assemble the car, a driver figure, and a thematically-appropriate accessory. In the case of the 1968 Ford Mustang Fastback, that accessory is a quarter-mile clock; for the M-Sport Fiesta WRC, it’s a spare hood and an alternate set of wheels. The driver figures in both sets are painted to look like they’re wearing racing suits, and they each get a helmet and a wrench. Last year was the first year of competition for the M-Sport Fiesta WRC in the FIA World Rally Championship, in which the car helped Sébastien Ogier reach the podium a total of nine times and claim the drivers’ championship. This year’s Rally Championship is underway now, and already, Ogier has seen victory in the M-Sport Fiesta, winning the inaugural round in Monte Carlo. The 1968 Ford Mustang Fastback? That doesn’t need to go racing; it’s always been cool.